Let’s get right into it. If you’ve just landed on this post, please read the past few “Data Exploration” posts on this project to understand the context of what I’m trying to do here in this post. Note that this post is almost identical to the last with the exception of replacing all 24:00:00 time values with 00:00:00. # Initiate SparkSession as "spark"
Let’s make the conversion of times here. Looks like it’s worked to me. Let’s continue. Okay, let’s check the dataframe for null timestamp values again. Okay let’s try saving as a parquet again to S3. Wait, we haven’t gone over parquets! Yet another term to learn for better or for worse. Let’s pretend here like it’s for the better haha. A parquet is a different method of storing a file. While CSV is raw text delimited by a comma, a parquet is a much more intricate and complex data storage algorithm. Its advantage is that its a columnar storage format, which means that each column is stored separately, rather than each row (think about when you open up a CSV, you generally read it by rows. Only when you format the data into a Python array or a Python / Pyspark dataframe can you really start referring to it by columns. This gives us storage and speed disadvantages. The storage advantages come from the fact that each column now has a specific context. 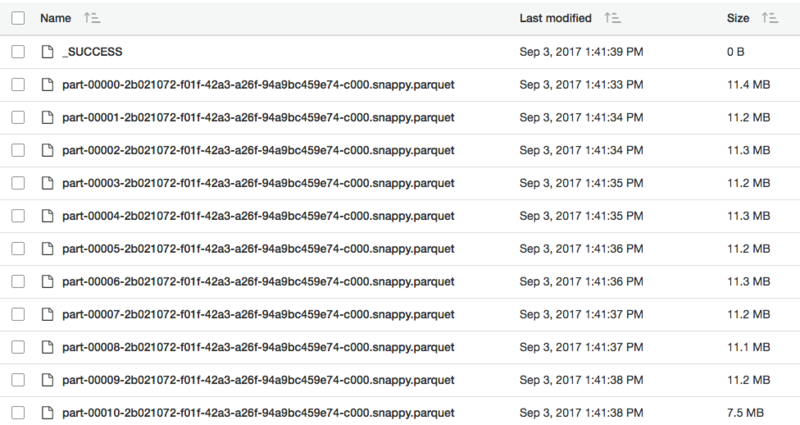 Just like how a Pyspark dataframe column can be designated as a string or float or timestamp, parquets have overhead and metadata within the file that make this distinction as well, again, because the data is being stored in a columnar format. Even further, this then allows us to actually encode and compress columns in specific ways, gaining efficiencies where possible. The speed advantages, gain, stem from the columnar format and builds on top of the storage advantages as well. When querying data, often, we only want to select one or two columns, right? The columnar storage format actually allows us to only scan specific columns and, therefore, we don’t need to scan the entire file like we would if we loaded up an entire CSV! The fact that the data is compressed also implies that we end up scanning less raw binary (with some overhead to uncompress, but compute power is much faster than disk reading). A hidden advantage here is that my AWS storage & data transfer costs should go down as well! This is all I know about parquet for now, and I won’t really be taking advantage of anything other than the compression abilities of parquet right now (I will still end up loading the entire parquet to Spark working memory and slicing and dicing from there), but good to know for the future as AWS is starting to build out services standardized on parquets. This sums to a grand total of… 120MB. Good for a compression of 91%… This doesn’t even seem real, but I will absolutely not complain for now. Talk about storage gains… sheesh. Anyways, our file is finally stored. Let’s actually continue onto actual anaylsis-oriented exploration!